I had heard of private antique collectors. However, I hadn’t met one before or fathom the reasons why people have a penchant for collecting old things. Until I met Ramprasad. Holding a beautiful hand crafted vase, Ramprasad explains, “this is a very rare Chinese vase. The style of work is called Cloisonne. It’s more than 200 years old.” Pic: Poornima Dasharathi. Ramprasad has a mechanical engineering background and works in Bosch, India. He has travelled to other countries especially Germany on work. He lives in a middle class colony in Chamarajpet. The house from outside looks like any other cement and brick construction from the ‘80s with an elegant garden surrounding it. As I enter his home, my eyes caught a beautiful painting in the verandah and an elegant bird bath on a carved wooden pedestal. As I climb the stairs, I spotted soapstone figurines on the mantel. As I enter the first floor hall, I travelled back in time into the world of elegant lanterns, exquisite porcelainware, sturdy cane and wood chairs and carved rosewood tables. Sitting on an upholstered chair, Ramprasad recollects, “My first love has always been gardening”. He recalls his trips to Lalbagh as a kid and explains how all the maalis (the gardeners) of those days were sent to London for training. European figurines. Pic: Poornima Dasharathi. How did he start collecting antiques? “Old things have a certain charm. You can see the amount of effort and love gone into making of every piece, unlike the mass production that happens today”, he explains. His sister, Ramya, intervenes that as a child, Ramprasad was always scouring the attic during their visit to their grandmother’s place. This love developed into a full fledged hobby when he started earning. He regularly collects items from antique shops, families who want to give away their old items and from homes that face demolition. As he gives a tour of his collection, I was astonished to know that the small elegant European figurines with lovely lacework was all porcelain. There was no lace used at all! Two of the artistic opaline coloured glass centrepieces, with a distinct wavy pattern, came from Anglo Indian homes in Bangalore, he says. “You’ll be surprised to know that our city has many European antiques”, he enlightens. A centre table held by two elephants. Pic: Poornima Dasharathi. Holding a beautiful hand crafted vase, Ramprasad explains, “This is a very rare Chinese vase. The style of work is called Cloisonne. It’s more than 200 years old.” Cloisonne is a technique of decorating metalwork with enamel and inlays of gemstones or glass. His collection includes a set of Beidermeier glasses which are around 150 years old. Antique collection comes with its own challenges. Ram recalled that he was given just one week to purchase a beautiful wooden centre table supported by two elephants. More than a century old, he explained the carved edges are a style that is not found in recent times. While the collection upstairs is largely European, the verandah and the hall downstairs had many Indian antiques. The painting that mentioned earlier is by the famous court painter Hanumaiah. A painting by the famous court painter Hanumaiyya. Pic: Poornima Dasharathi. A planter’s chair invites one to rest in one corner of the hall. In another corner there is a set of brassware. I was especially attracted to a cow head-shaped tap and a collection of betel nut cutters. The vintage items lent a charming elegance to this simple home. Whether it’s the brass fruit holder or an old table-top fan or even the hand brewed coffee maker, everything looked graceful and pleasing to the eye. Antique collection is an expensive hobby. So how does he manage it? Ramprasad agrees. While he has been able to buy some items at a good price, there were others for which he had to shell out a big sum. He cycles everywhere to save on fuel cost. He also teaches German for additional income. He also explains that those in the antique business know their customers. So generally they sell an item for less to a buyer who knows its value and will preserve it rather than to somebody rich but ignorant. By now, my head swimming in the ancient world, I follow Ramprasad to the balcony and the terrace. His garden had won the Lalbagh awards in the house garden category many times in the nineties. Ram grows Bonsais, orchids and other unique plants. He showed a bonsai Peepul tree that he has had since he was in fourth standard! 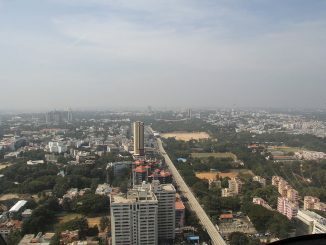 There are many things about Bangalore that can and should be criticised. However, it is always better if the criticism is constructive, says this citizen journalist. Cell phones : Do they affect your health ? A large number of people today, carry more than one cellphone. Know about the radiation effect from a mobile and its implication on health issues. Despite the ban on Taxi For Sure and Uber by the state Transport Department, they continue to operate in Bengaluru. this is radhakrishna from tv9. pls give me ramprasad contact number.